As An Official Proud Sponsor! Check out John's No Frill page on the Shelburne Freelancer . Go to the option bar ! Is The Town Of Shelburne Going Cosmopoitan? New Electronic Signage Installed Infront Of Town Hall! Do you have your Ballot filled out? You could win up to $200 in product! You may have," THE LUCKY TICKET!" Wondering how it went? Althea Casamento, one of the three Marketing Momma's commented,"We raised $240 for Sharon Morden of Feral Cat Rescue and had a great turn out. Our vendors and the public were very pleased. Will also raised a bit for the Sheppard cupboard food bank. We will be also listing the winners of the raffle shortly." Photo generously provided by The Marketing Mommas (LtoR)Marketing Momma, Althea Casamento, Sharon Morden of Shelburne's Feral Cat Rescue, and Marketing Momma's Lindsay Wegener, and Jill Brace. Click here to visit the Photo Gallery Of Craft Shows in November and see vendors who attended TMM's Christmas Extravaganza Craft Show. Click here to go to Marketing Momma's FaceBook Page for more information. Shelburne Mayor, Ken Bennington welcomed Maxie's Caribbean Take-Out to Shelburne during their Official Ribbon Cutting Grand Opening Ceremony. Owners, Yazmine and Michael Lewis are thrilled to be in Shelburne and the feeling is reciprocated! Authentic Caribbean Cuisine offered right here in Shelburne and on Shelburne's Main Street! Meet Maxie's Caribbean Takeout owner's on the video below. Click on the link! Just to let Shelburnites know,..The Shelburne Freelancer gives Maxie's Caribbean Take-Out's Jerk Chicken Five Stars! Click here to watch video welcoming Maxie's Caribbean Take-Out to Shelburne! by Tara De Dominici McCreadie. Owners of My Crafty Neighbour (LtoR) Tara De Dominicis McCreadie and Laura Meakings have cause to celebrate as their annually held Christmas Craft Show hosted at the Warrior Hall in Shelburne's Royal Canadian Legion was another resounding success! The event was host to over 40 Vendors, raised $2386.45 for Sick Kids Hospital, and let's not forget the food raised for Shelburne's local Food Bank, the Shepherd's Cupboard, as seen pictured below, weighing in at 253.5 pounds! The above photo was generously provided by Tara De Dominici McCreadie. McCreadie and Meakings had a special young lady in mind this year when choosing which charity they would raise money for. McCreadie's eight month old niece, Alani De Dominicis was born with a rare form of Cancer called, Retinoblastoma. Diagnosed at just five months old, a decision was made to remove one eye as this Cancer is known to be aggressive. Now in treatment attempting to save her remaining eye, Sick Kids Hospital has basically been a home to the infant, and her entire family are grateful for the care she has received according to McCreadie. Proud parents, (LtoR) Tyler Martins and Devin De Dominicis attended the Craft Show, even though the beautiful Alani was not able to attend. McCreadie was pleased with the results of the Craft Show's fundraising,commenting, " The more awareness about this type of cancer, the better. The money is actually going towards the fight against Retinoblastoma. " When friends and business partners come together for such a worthy cause, good things are sure to follow.Of course the mark of a true friendship so obviously portrayed between McCreadie and Meakings reflects so positively upon their business, their families and their community. Shelburne is grateful for having the ability to shop vendors items located right in the heart of our community. Didn't get to the show? Click here to see the vendors. For more information visit the My Crafty Neighbour FaceBook Page. Click here. But An Aid To Survival! For some, knitting,sewing, mending, tying knots that never come undone are forgotten and unnecessary skills in today's society, but there was a time when material items such as handmade sweaters, scarves, blankets, clothes, were in fact, a manufacturing ability, an important set of skills for daily life and in the event of war, absolutely essential to survival. (Above)Local resident, War Reenactor, George Bricker, a Textile Engineer and Historian, took up the skill of knitting in order to present a more accurate portrayal of a soldiers life during quiet times in the evening or just trying to mentally pass time and escape the horrors of war while doing something constructive. Many of the best knitting patterns today, are created by men. Stereotypically, a "Grama" thing to do, knitting has been proven to be a mental health rescuer, relaxer and is definitely not gender oriented. Bricker often attends Sit & Knit afternoons at Shelburne's local knitting supply store, the Wool & Silk Co., which is a wonderful, clean, beautiful shop, offering a full selection of yarns and is a welcomed surprise to anyone who enters. Owner, Diane Griffith keeps the shop very current with wonderful gift ideas, kits for all ages and skill levels and the best part- shoppers can usually find any kind of yarn they need. Shelburnites no longer have to travel to Orangeville, or farther away to meet their shopping needs. Griffith is one more reason to shop local making Wool & Silk Co.one of "The Best Knitting Shops" in Dufferin! 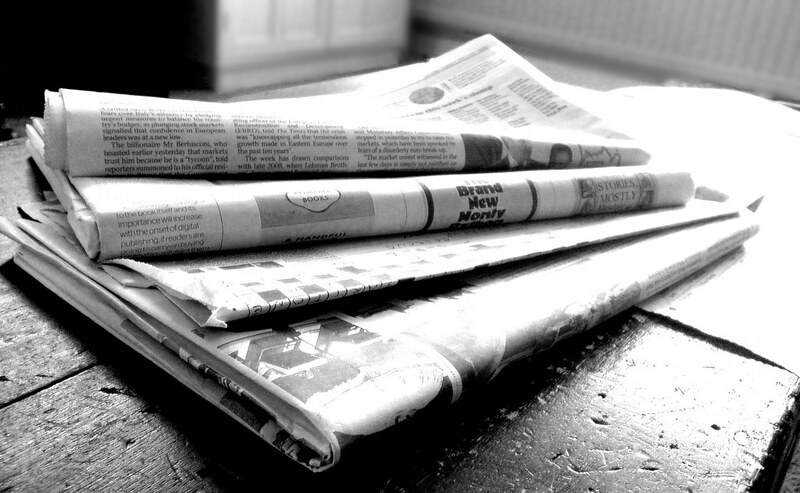 Don't trust this article, stop in and see for yourself! The only question is what will you knit with all the time you saved shopping local? 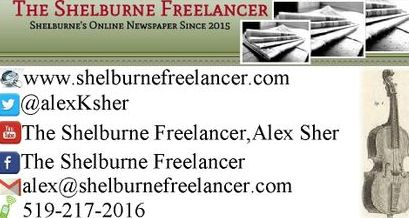 Tell'm The Shelburne Freelancer sent y'ah and enjoy! 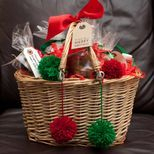 Schools, churches, businesses, and community groups such as the Brownies are participating in the collection of items for the hampers. Besides the schools, collection locations confirmed to date include the Shelburne Arena, Royal Bank, Wool & Silk, Turn it Out Dance Studio, and the Compass Church. You can drop off items for donation at participating locations at any time, or at the Mel Lloyd Centre Community Meeting Room from December 14 to 18. The Primrose Elementary School Me to We group has generously offered to help pack the hampers. Through the hard work of the committee, a number of food and personal items, including turkeys, squash, cranberries, potatoes, shampoo and conditioner, body wash and toothpaste and toothbrushes have already been fully sponsored for the Christmas hampers. While non-perishable food is always welcome, please consider donating toys that will then be available for pick up in Shelburne by those in need, as well as the following: wrapping paper, cards, gift bags, seasonal decorations, mitts, hats, socks, and personal care items - anything that you would buy to make your own seasonal celebration special is appropriate for the hamper program. Not surprisingly, cash is very much appreciated, as it enables the committee to buy whatever it needs to supplement donations – if you wish to make a cash donation, please contact Bobbi Ferguson at 519-278-4578. If you would like to apply for assistance from the Christmas hamper program, phone 226-200-0235 or e-mail shelburnechristmashampers@gmail.com. Registration dates are November 25 and 26 and December 2 and 3. Thursday, November 19, 2015 marked an important end and a very important beginning for students, teacher's and the entire Glenbrook Elementary School Community. A dream, two years in the making finally came to fruition as the "Glenbrook Elementary's Natural Playground Is Now Officially Open!" During the school assembly held before the Ribbon Cutting Ceremony, The Kinsmen and Kinettes of Shelburne generously presented the School Council with a cheque for $1000. Noteworthy, and greatly appreciated by Glenbrook Elementary, other funding for the project primarily came from School Council fundraising endeavors, grants from CST Inspired Minds Learning Project of $1,100, UGDSB Greening Schools of $300, Evergreen Toyatoa, of $1,100, Orangeville's Scotia Bank's fund matching program and annual school Dance-A-Thons bringing in a whopping $5000 in 2014 and 2015.
Who could say "Thank You" any better than this? The idea of a Natural Playground is to provide kids with a forum to use their imaginations while experiencing natural elements. Even the trees planted will attract not only specific birds but butterflies as well, and Glenbrook's plan is so well devised, a bird has already received the invitation and built a nest in one of the trees already! A very inclusive environment, designed for kids to explore many aspects of play including scientific, and kinetic. The playground will only be available to the public outside of school hours. Far more inviting than an already structured environment, the sky is the limit and last but not least, because the entire school population was involved in the playground from it's conception to completion it will be very well cared for, belonging to all! Congratulations To Glenbrook Elementary School from the Shelburne Freelancer on a job well done! Glenbrook Elementary's Mascot, the Glenbrook Grizzly was also on hand to celebrate, giving bear hugs and high-five's making the day even more special. When Was The Last Time You Went Clogging? NOT THIS KIND This Kind! "Anyone can learn to clog!" commented Clogging Instructor Sue Pfeiffer, a 15 year veteran Clogger. Clogging requires a special tap shoe where some of the metal parts on the toe and heel of the shoe are not entirely screwed into the shoe very tightly allowing a 'double'click sound and differentiating that sound from regular tap dancing. Pfeiffer offers classes at the Mel Lloyd Centre in Shelburne on Thursday evenings that range from Beginners, Beginners Plus, Low Intermediate and Intermediate. The nature of clogging is so all inclusive, that all ages can be found in any of the classes from seven year olds' to seniors. What a fun way to stay fit and at only $10 a class, this art form/exercise entertainment is wrapped in in an affordable price. Pfeiffer also teaches in Alliston on Tuesdays and when asked why she teaches clogging, without hesitation Pfeiffer answered, "Clogging is my passion." So enjoyable, now many more can say the same as smiles are seen on all participants of the class as Pfeiffer calls out the moves to a wide variety of today's Country and Classic Country Music. For more information contact Sue Pfeiffer at 705-435-7122 or email footloosecloggers@rogers.com and find out when you can get started having fun clogging! (Above)An example of clogging shoes where the space created between the metal plate and the shoe provides an extra double tap when hitting the floor. These ladies know how to have Fun! Watch the video! Enjoy! "It Could Happen To You!" During Shelburne's RBC Fraud Prevention Seminar, held on the evening of Wednesday, November 18, over a dozen people found out how to better protect themselves against Fraud. RBC Branch Manager,Josie Green welcomed attendees to a number of explanations involving different kinds of scams, password protection, power of attorney concerns, reminding the audience that not only senior citizens are at risk, everyone is a target. To help convey that message, (standing LtoR) guest speakers, RBC Client Advisor, Jocelyn Colley, Shelburne Police Media Relations Officer, Constable Paul Neumann, and RBC Branch Manager Josie Green also took many relevant questions from the audience. A real concern for many people these days is the classic "Romance Scam" where according to Green, Canadians reportedly lost over 13 million dollars last year. The Romance Scam involves meeting a person online, forming a relationship which quickly turns into drama after drama requiring money to bail that person out of whatever situation they have concocted. Excuses can be anything from, that person needing money to visit but someone has stolen their wallet, emergency operation and they haven't the funds, to simply needing to borrow cash. Green cautions, "Fraudsters are predators and everyone can be vulnerable." Green gave an example where the well known company, Publisher's Clearing House, sent a person a check to be cashed,but not at their branch and cashing that check would cost over $5000 to be sent to Publisher's Clearing house first. Explained this way, the scam does seem suspicious but tried and tested, this is a scam that really works. RBC Client Advisor Jocelyn Colley also reminded that Banks do not send personal emails to clients, EVER, and if that happens to call the bank, ask questions, and stay safe rather than getting caught up in a scam that could result in the loss of a life savings.If you do receive an email from your bank, simply do not open it, delete it. a good precaution to avoid your computer from getting hacked is to change your password and user name every six months, remembering to only access websites you like, or email in a private environment. Another scam called the Grandparent Scam involves a stranger calling, identifying themselves as a person representing a grandchild. Immediately, the grandparent questions, " Johnny? Is that you?" Now the scammer has acquired the name of a grandchild and proceeds to explain that grandson has been travelling and has been arrested or held at the airport in Mexico, or some other horrible situation which requires immediate financial action in order to save them. Often the person in question is actually at their job, with their family, has never travelled and a quick phone call to check to see where the person in question is, can save you money. Green passed around to the audience this photo copy of a scammer check brought in by a local resident to indicate just how real these checks look and how believable the scamming situation can appear.
" Predators can put the fear of God in you. These checks look real. Technology can do great things! ", commented Green. Green had another piece of advice based on years of experience involving 'Power of Attorney', commenting, "If someone has the ability to touch your money, you can be taken advantage of. Update your Power of Attorney, and try to make sure the person you have named to be in charge is someone who will do right by you," cautioning," Someone you trust,be that a friend or relative, even a son or daughter can commit fraud." Seniors are well known for simply giving their debit card or credit card to a loved one to perform shopping for them, and that is giving free access to that person to help themselves to the senior's bank account. Shelburne Police Media Relations Officer, Constable Paul Neumann touched on quite a few interesting fraud topics prefacing with a request. " One thing that could really help us as law enforcement to act quicker, would be if residents actually called us at the time of a concern. "So many times we are called three days later only to find out that three days earlier, a resident did notice a suspicious character in their back yard but weren't sure if they should bother the police. Call us. ", commented Neumann. "If you have a joint bank account or give someone access to your account, and that person takes liberties, that is not fraud but rather a civil matter. A criminal matter would occur when someone does not have access or permission to use your account and finds a way to take advantage," Neumann explained the difference between a Civil Matter and Criminal Matter. Neumann also mentioned that Shelburne is one of the few Towns where door to door sales people must register at Town Hall before. Making reference specifically to door to door sales people, Neumann reminds Shelburnites they do have the power to ask sales people to leave and if concerned to call the Police. Recently there was a scam involving furnaces and sales people ask to inspect the furnace and then later call to report the furnace must be changed, but not by them, by a third party, which is suspicious. Also some good advice is to never allow two people in to inspect the furnace and leave one in the upstairs while you show the other to the furnace. Neumann reports many residents have discovered jewelry and personal items have been stolen and that weeks later, those residents may have experienced a break-in. It does not take long for thieves to take a look around and decide if they should return later. Highly recommended are written estimates for yard workers, and letting the sales people know you will call them meanwhile checking online to see if they are a business, carefully checking to see if the number they gave you is different than the actual business number, otherwise, you could find yourself calling someone sitting in their car around the corner from your house. What do Fraudster look like? Anyone and everyone! Neumann recounted a time when he worked in Toronto where he encountered a Policeman impersonator cautioning, "Police will never ask you to become an on the spot agent to help with a situation." Helpful advice to note when encountering telemarketing scams, is to press *51 immediately after a concerning call received on a landline. This act will immediately register the last number you received with a service that will be able to trace the number back to the scammers. The service does not at present work with cell phones. So many more topics were discussed. it will be worth attending next year if you can. If you experience a Fraud encounter, contact Canadian Anti-Fraud Centre at 705-494-3182 and report the incident. There is no such thing as a stupid question and RBC Branch Manager, Josie Green and her staff are dedicated to help keep you safe. Also on hand during the seminar were RBC Staff Members,Banking Advisor, Olive Squier, Client Advisor, Beth Boyd, Investment and Retirement Planner, Amy Rounding, Client Advisor, Tina Vanderveen, Financial Planner, Robert Briand, and Manager of Client Care, Andrea Whitten. Everyone mentioned above is trained and always available to help keep you protected against fraud and they really do want you to be safe. If you have questions, reach out . You'll be glad you did! Christmas Shopping In Shelburne, an event held at the Mel Lloyd Centre, Saturday, November 7, received a great shopping response and welcomed a new resident to Shelburne who also owns a small business, MELS COSMETICS. Welcome To Shelburne Melanie Laird! Laird, a vendor at the craft show is also a representative of the Cosmetic & Skin Care company, Younique! Contact MELSCOSMETICS.COM, 416-875-4420 AND Melanie.A.Laird@ gmail.com. The Shelburne and District Fire Department is urging everyone to keep fire safety in mind as the temperatures turn colder. to COSafety.ca to find a contractor near you. excessive creosote build-up in chimneys. container with a tight-fitting lid. Keep the container outside. including curtains, upholstery and clothing. cords and use the proper gauge extension cord for vehicle block heaters. • Ensure that vehicles are not left running inside any garage or building. • Ensure there is a working smoke alarm on every storey and outside all sleeping areas. • Install CO alarms to alert you to the presence of this deadly gas. carbon monoxide alarms, or fire safety, contact The Shelburne and District Fire Department. The above generously provided by Shelburne Fire Chief Brad Lemaich upon the request of The Shelburne Freelancer. Click here to go to Remembrance Day 2015 for all coverage. Videos coming soon. Christmas Items Have Already Arrived! links to their current flyers. Where Were You On Sunday, November 8th? Pick'in In The Park Jamboree! That's right! Greg and Heather Holmes of Homes Appliances & Music Shop, are also the fearless organizers of the now famous event, Pick'in In The Park, held annually in the summer venue of Fiddle Park, right here in Shelburne, are now hosting Jamborees! What an excellent and entertaining way to spend the afternoon, dancing, playing the fiddle, performing with your band, and as the expression goes, "Good Clean Fun!" Stay tuned to The Shelburne Freelancer as there is video to come soon. Upcoming Jamborees will be held starting in 2016, Jan 10, Feb 14, March 13, April 10, May 8 (2nd Sunday of each month). (L)Enjoy the video folks! Click on the white arrow in the middle of the screen. Canada's NEW Prime Minister, Justin Trudeau! 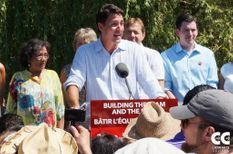 Trudeau promised change and delivered Canada's new Cabinet Ministers, half male,half female, diverse in culture and personal histories. With such great change afoot, Canada's future, represented by these Cabinet Ministers looks more Canadian than ever before and as Trudeau says, "Sunny Days Ahead!" Neil Orford (L)created the Digital Historian Project (DHP) to provide a unique learning experience for students from three secondary schools: Centre Dufferin District High School in Shelburne, Orangeville District Secondary School, and Westside Secondary School in Orangeville. Continue reading media release by Heather Loney, Communications and Community Engagement Officer for the Upper Grand District School Board by clicking on the link below. School News In Shelburne page. Find out why History is important in this exclusive video interview with Award Winning, Centre Dufferin District High School History Teacher, Neil Orford. Click here to find out more about the Digital Historian Project on Canada's History website. Finally, A Reprieve For Students! Is A "Tentative"Agreement To End Work To Rule Better Than Nothing? Elementary Teachers Union reaches tentative deal with province-ends work to rule! CUPE Custodial and Maintenance workers reach tentative deal with province- end rule to rule!